I had the worse hair day ever on Saturday. The weather I am sure had a big part in making my hair stick straight up everywhere like a crazy lady. When all else fails I guess you put a hat on it. And that is exactly what I did. 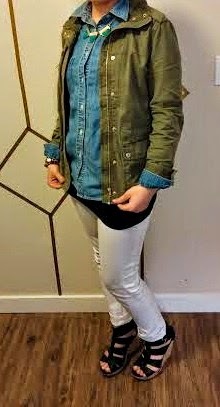 I wanted to break out my white jeans but since it was still a little cold out, I went with throwing my utility jacket on as well. 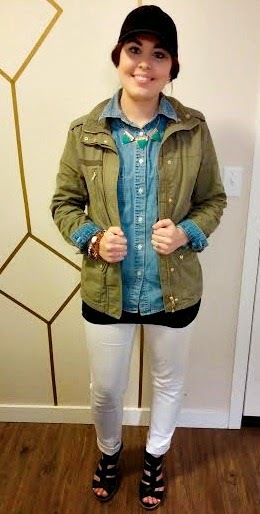 I am kind of obsessed with this utility jacket by the way! It is probably the one and only reason I will be sad summer is here. Call me crazy but it is true! I picked up these wedges at a thrift store last year but did not get the chance to wear them to often. This spring and summer I will be sporting them as much as I can. They are Merona brand from Target and I scored them for only $2.99! I am looking for more ways to style these jeans this summer but knowing my luck if I start wearing them more often I will probably spill coffee or food on them. 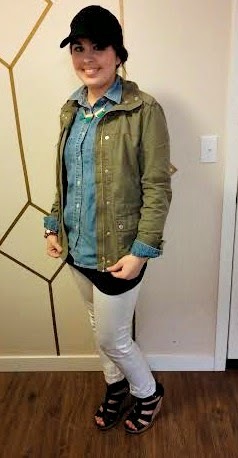 Do you any of you have white jeans and if so how do you style them?